Releasing your own educational resources as OER is as easy as applying a suitable licence and making the content as widely available as possible. Of course, that implies making sure you have cleared copyright on any third party material you use. Many universities and institutions around the world are implementing policies and schemes to encourage – and even reward in some cases – academics to release their own teaching materials as OER. For instance, the University of Edinburgh (UK), in line with its values and mission, has introduced a policy encouraging staff and students to use, create and share OER – recommending the use of the CC-BY licence: http://www.ed.ac.uk/files/atoms/files/openeducationalresourcespolicy.pdf. Another well-known case of a university implementing an institutional policy is the University of South Africa (UNISA). For further details on this consult the case study included in the OpenMed Compendium. However, if you are not lucky enough to work at a university that has already implemented an Open Education or OER policy, you should check with your employer before releasing your teaching materials as your institution might also be copyright owner of the work you do as a result of your employment. Many universities have repositories where their academics can archive their publications, but also teaching materials. Usually repositories ask contributors to specify the licence they need or want to apply for each file as part of the deposit process. Many academics have their own personal website or blog, sometimes supported by their institutions through a Domains of One’s Own initiative (DoOO), and this is also a very good way of sharing content as OER with the world. In order to do so, apart from creating your site, you will need to decide which specific licence you would like to choose for the release of your works. Beyond releasing granular content (for example, stand-alone videos, books, audio files), there are also tools that enable the creation of OER courses. 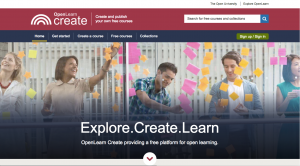 For instance, OpenLearn Create (http://www.open.edu/openlearncreate/) is a platform developed by the UK Open University that allows anyone to build and publish their own open courses. Apart from sharing content, it also offers the possibility of including interactive activities (for example, quizzes) and opportunities for interaction with other learners (for example, forums, peer-review). Moreover, it can also allow the issuing of digital badges so students completing a course can easily showcase their achievement. For more tips and detailed instructions on how to share your resources as OER, you may check the guide How to make your resources open guide by the University of Edinburgh.